Starting in the early sixties, Fluxus followed in the footsteps of the Futurist and Dada avant-gardes, going against the established grain of Fine Art and Official Art. Fluxus‚interdisciplinary aesthetic brings together influences as diverse as Zen, Science and daily life, and puts them to poetic use. Initially received as little more than an international network of pranksters, the playful artists of Fluxus were, and remain, a network of radical visionaries who sought to reconcile art with life.Dating from the sixties and compiled by George Maciunas (1931-1978, founder of Fluxus), the Fluxfilm Anthology is a document consisting of 37 short films ranging from 10 seconds to 10 minutes in length. Elements of ephemeral environments, these films, some of which were meant to be screened as continuous loops, were shown as part of the events and happenings of the New York avant-garde. Made by the artists listed below, they celebrate the ephemeral humor of the Fluxus movement. 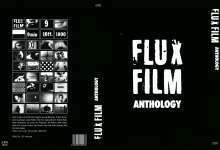 Contains a 32-page booklet by Maeva Aubert presenting the Fluxus artists and films.